Be the first to share your favorite memory, photo or story of Jae. This memorial page is dedicated for family, friends and future generations to celebrate the life of their loved one. 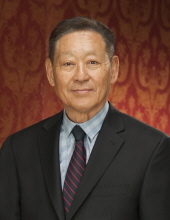 Jae Woon Shim, age 72, of Matthews NC, passed away on Monday, March 25, 2019. A funeral service will take place on Friday, March 29, 2019 at 11:00 AM at the Peachtree Corners Chapel of Crowell Brothers Funeral Homes & Crematory. The family will receive friends on Thursday, March 28, 2019 starting at 7:00 PM at the funeral home. Jae Woon is preceded in death by his parents, Ho Jae Shim and Ki Soon Chun. He will be greatly missed by his wife of 45 years, Jae Ok Shim; sons, Dr. Chris Shim (Sora), Tom Doo Chin Shim; daughter, Dr. Jean So (Chong); brothers, Jae Young Shim (Jung Sook), Jae Hyok Shim (Jeong Hyun); sisters, Ann Lee (Peter), Kris Zemla (David); grandchildren, Nolan Hyunbo Shim, Parker Yunbo Shim, Dylan Jinbo Shim, Christian Jiyoon So, Emily Suhyan So and numerous of uncles, aunts, nieces and nephews. On-line condolences may be expressed at www.crowellbrothers.com. Arrangements entrusted to Crowell Brothers Funeral Homes & Crematory, 5051 Peachtree Industrial Boulevard, Peachtree Corners, GA 30092. 770-448-5757. To send flowers or a remembrance gift to the family of Jae Woon Shim, please visit our Tribute Store. "Email Address" would like to share the life celebration of Jae Woon Shim. Click on the "link" to go to share a favorite memory or leave a condolence message for the family.